Find a shape (plane figure) of a given perimeter which has the largest area. After a bit thinking easy to reply that of course, the circle is the solution of the task. Swiss mathematician Jacob Steiner ( 1796 – 1863 ) gave a number of ingenious proofs, and he was sure to solve the problem. But already the German mathematician Dirichlet, who was Steiner’s contemporary, called attention for the deficiency of the proofs. Let’s see one of Steiner’s proofs. 1. The solution of the task can not be concave, because if it would be and you take the smallest convex shape that contains it, the convex area is obviously would be larger and the perimeter would be smaller, because between two points is a straight line is the shortest. Enlarging the convex shape so big that his perimeter should be the same size, the area continues to grow. 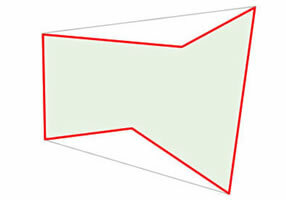 So we can find for a concave shape a convex one with the same size perimeter but the area is bigger one. 2. Consider now the shapes that have a chord that goes halves in the perimeter but does not halves in his area. Assume that the T area in the figure is higher than the L area. Delete the smaller L area and reflect the bigger one to the straight of chord. We receive two shapes of the same perimeter, but the second has a bigger area. The chord AB which can be seen on the figure goes halves in the perimeter and the area as well. Since the shape is not a circle, so there is a point P, from which the chord AB does not appear at a right angle. Adjust PA and PB at a right angle APB and keep shaded parts of the shape. Reflect the resulted shape to the straight of chord AB. The perimeter of the received shape is the same size, but his area was growing, since triangle ABP was groving (the height for the AP side was greater) and the shaded parts of the shape has not changed ..
Steiner drew the conclusions from this: all the shapes differing from the circle can be found a shape whith the same perimeter, but with the larger area, so the area of the circle is the largest one among the shapes with given perimeter. The conclusion would be correct if we would know for sure that the solution of the task exist certenly! The interesting thing that seems easy to suspect the solution, however, to this day do not really have a simple, elementary proof it.